James Stanton Cone, one of the first settlers here, is the community namesake. The town was established around 1901 with a post office opening two years later. Landowner Charles "Uncle Charlie” Travis donated a site for a school and the Cone district was organized in 1905. Cone had an estimated population of 150 people in the late 1930s – the high-water mark of population. In the mid 1960s the school consolidated with Ralls and by the late 1980s, Cone was down to less than 50 citizens. It increased to 70 for the 2000 census and residents are eagerly awaiting the 2010 count to see how many of them there are. Cone Cemetery is 2 miles west on FM 193. 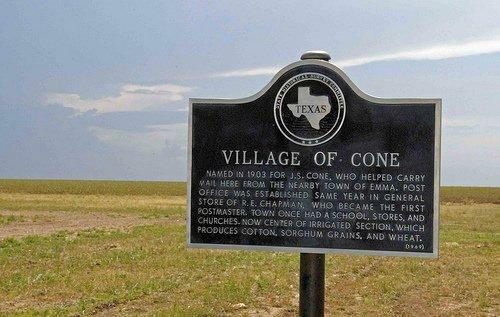 Named in 1903 for S. E. Cone, who helped carry mail here from the nearby town of Emma. 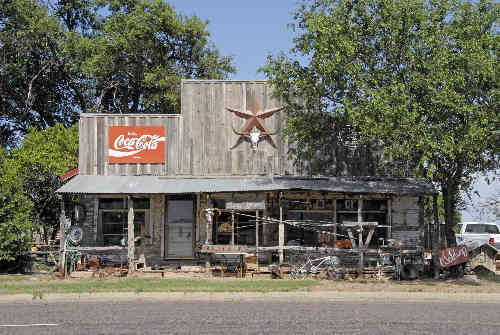 Post Office was established same year in general store of R. E. Chapman, who became the first Postmaster. Town once had a school, stores, and churches. Now center of irrigated section, which produces cotton, sorghum grains, and wheat. Founded with burial, April 17,1897, of W. G. English, Father of J. P. and E. M. English; on land patented by the state to J. P. English, October 9, 1897. 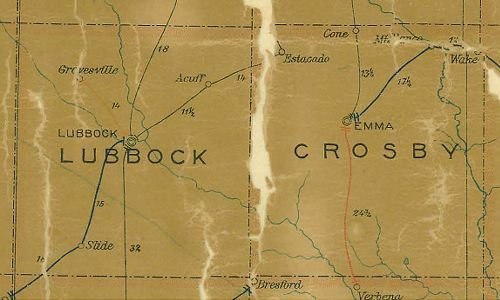 Title was adopted after post office was named in 1903 for rancher Stanton J. Cone. Cemetery was bought by Judge Pink L. Parrish for Crosby County, May 8, 1910.